Brace yourselves for a great set of cow riddles! Listed below are some of the best riddling questions related to the cow that we could find. Since kids are so mooved by cows, a majority of the puzzles contained here are for children. But there is a good portion of riddles here for other ages as well. It's cool to adult here! The process is simple. Read the riddles, examine the clues and try to solve. Some of these are a little tougher than others, take your time. Also, if you have any cow inspired riddles that you'd like to share, we would love to read them! P.S. If you need a fun activity for your children to do use these fun riddles as clues on a cow themed treasure hunt. An old farmer died and left 17 cows to his three sons. In his will, the farmer stated that his oldest son should get 1/2, his middle son should get 1/3, and his youngest son should get 1/9 of all the cows. The sons, who did not want to end up with half cows, sat for days trying to figure out how many cows each of them should get. One day, their neighbor came by to see how they were doing after their father's death. 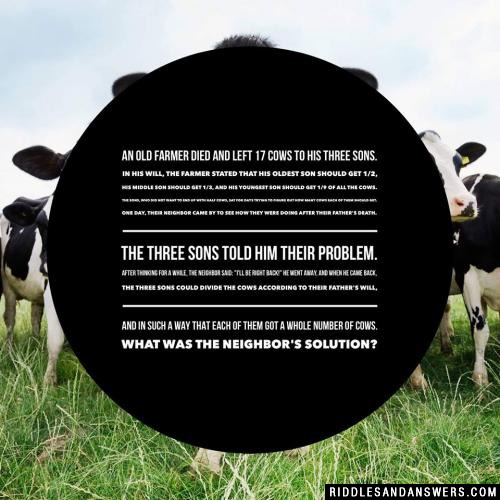 The three sons told him their problem. After thinking for a while, the neighbor said: "I'll be right back!" He went away, and when he came back, the three sons could divide the cows according to their father's will, and in such a way that each of them got a whole number of cows. What was the neighbor's solution? The neighbour borrowed an extra cow, to make the total number of cows 18. Then the oldest son got 1/2 of 18 is 9 cows, the middle son got 1/3 of 18 is 6 cows, and the youngest son got 1/9 of 18 is 2 cows. Since 9+6+2 = 17, the cows could be divided among the three brothers in such a way that the borrowed cow was left over, and could be returned to its owner. 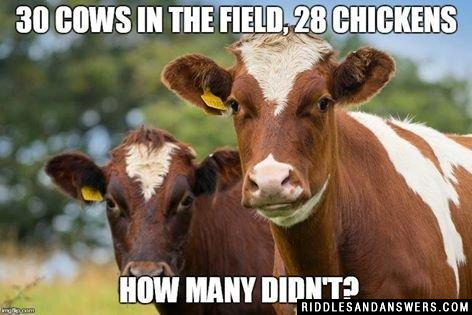 There are 30 cows in a field and 28 chickens, how many didn't? 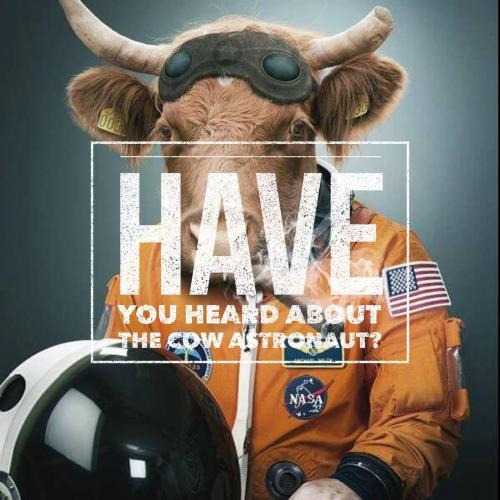 Why did the cow become an astronaut? So it could walk on the moooo-n.
What do you get if a cow is in an earthquake? How does a farmer count his cattle? Why does a milking stool only have three legs? What do you call a cow who plays the piano? Two cowboys live next door to each other and both have a corral for their cows in the back. One day they meet at the back of their homes, standing next to a wall dividing their corrals. The first cowboy gets to thinking and asks his neighbor for a cow so he can double his herd. The other cowboys replies, Thats fine by me partner, cuz then well have the same number of cows? How many cows does each cowboy own? Can you come up with a cool, funny or clever Cow Riddles of your own? Post it below (without the answer) to see if you can stump our users.